Hyper Light Drifter is one of many modern games that cribs from the chunky sprite-based look of yore. It’s now a commonplace visual style and frequently criticized as being either an empty stab at nostalgia or a resource-saving crutch for a game made by a tiny development team. Even when framed as a positive, the decision is often reductively described as a love letter or homage to the 8- and 16-bit era. While all of these characterizations are occasionally true, they don’t capture how pixel art has come into its own as a distinct design choice. While an intractable element of the look is referential to an older generation of video games, that’s not the whole of it. Like shooting a film in black-and-white, choosing to use pixel art is to opt for a technological limitation and an impressionistic look. It’s stylized and borderline abstract, which, at best, engages the player into providing their own details. For Hyper Light Drifter, the strict rules of primitive pixel art are bent to allow the incorporation of modern techniques. Broad swaths of soft gradient offer a subtle depth and color change that would be impossible through “dithering,” the term used to describe the way different colored pixels blend to create the semblance of color transition and shading. In one exemplary scene, you come across a neglected pre-war robot frozen underneath a hole in the ceiling. The robot itself is harshly geometric and rendered in a two-tone color scheme, with the sides in shadow and the top lit by the soft sunbeams pouring in from above. The contrast provided by the subtle lighting makes the robot’s body seem even more stark and impenetrable. A few angry-looking glowing red points stipple its shadowy surface, and that color accent is repeated in architectural elements around the room, unifying the whole space to cultivate an air of suspended but eminent violence. It hints at the whole thing waking from a slumber specifically for hitting-you-until-you-are-meat-jam purposes. That tension between hard-edged pixel and soft pastel color is applied to great effect through the entire game. Hyper Light Drifter understands that the post-apocalypse can have tons of color; it can be lovely, even. Your hero will walk through fields of rich shifting blues and greens that sprout precise little four-point flowers. Neglected and rotten tech—rigid pillars of a past civilization—will lie broken and subsumed underneath accumulated mounds of moss and vine. 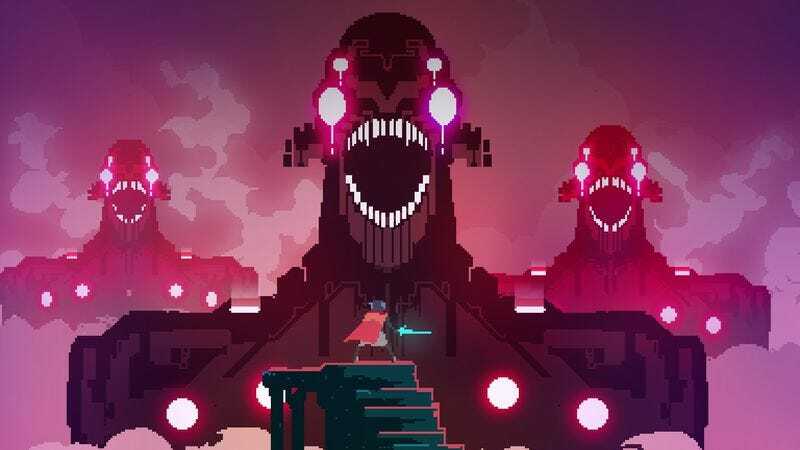 Hyper Light Drifter uses these two key applications of classic and contemporary game visuals to tell a story about a hero who hovers between the past and present. It’s very clever, but most importantly, it’s very beautiful.